A lot of classes inherit the abstract Basepart class. Using Basepart is very useful as we all know. I think that should be enough to make my point clear - at the moment I’ve got to say I was liking the old wiki a bit better, but I know the hub is still in development so I’ll have some mercy at the moment. I just don’t want any loss of functionality when porting the old wiki to the hub. Other than the content, I like the site layout a bit better. Thanks! How can I access the "Old Wiki"? Support, other exemples are ValueBase (like IntValue, BoolValue) or BodyMover (like BodyForce, BodyPosition). It doesn’t show those on the wiki page of the objects. 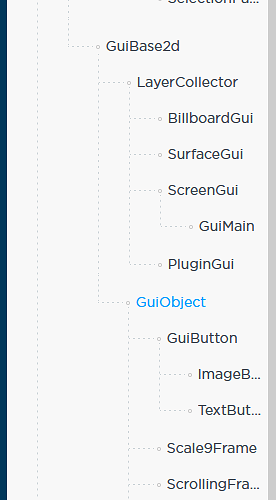 What you can do currently, is enable ‘Class Tree’ view on the left hand side collapsable side-bar. Then you can see a full class tree of inherritance. I know there is search, but I’m not going to move my cursor all the way to the search bar, remove my hand from the mouse so I can type, and then switch back to the mouse – that’s way too much work, and the devhub sidebar relies too much on the search bar for how little it helps. design of the wiki did a really good job at providing necessary information without making it hard to find in a bunch of fluff. We hear your feedback - thank you for the detailed response. This is still an issue. 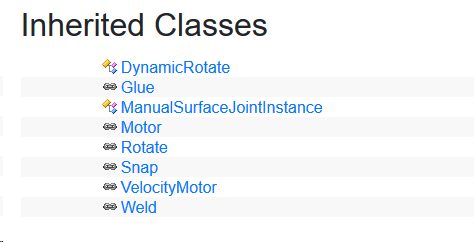 The old Wiki had this information laid out which really helps in discovery of related classes for different use cases. The class tree is as close as we’re getting right now I think. I liked it better when it filtered out all the other classes that you’re not gonna be looking at so you don’t have to scroll for 15 minutes to find the class you’re looking for. You could CTRL+F for it, but that’s no excuse for the web design to be less intuitive. I marked this solved because, fundamentally, it’s the same I guess. Old one was better though.